This is plate one from James Baillie Fraser's 'Views of Calcutta and its Environs'. Fraser (1783-1856) arrived in Calcutta in 1814 and in six years had produced these animated sketches of the busy city. 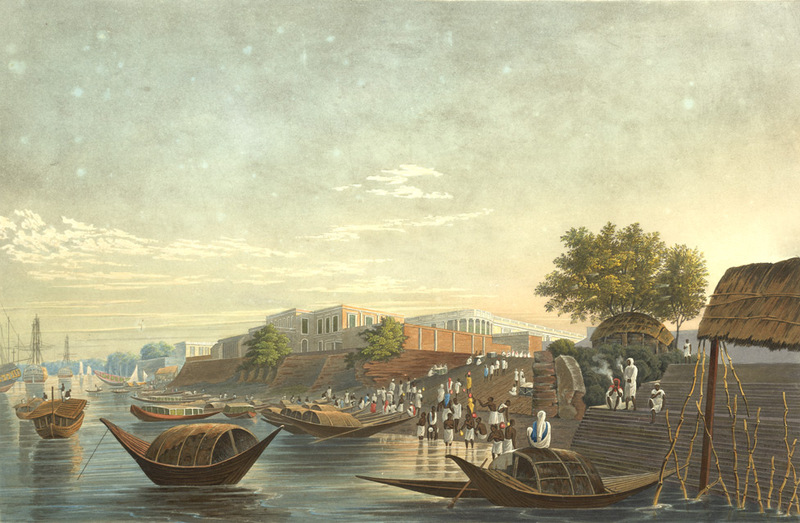 This first plate in the collection extends from the west end of the city, where Esplanade Row meets the River Hooghly. It was the main landing place for visitors to the city and "fast-growing and squalid, largely owing to the presence of a tank [reservoir]". The chunam-covered buildings, shining brightly in the sunshine, as here, were an exciting introduction to the city.